There's been a growing concern among readers and myself that the IceHL's 13 Weeks of R&R has been suffering creatively. A handful of the newly selected team names have faced a lot of harsh criticisms. What I want to know before we proceed to logo designs is whether this is a vocal minority. If it's not, as commissioner I will take steps to fix things. In the polls below — which will last only through this weekend — you can vote on whether you're satisfied with the names that have been chosen. I recognize that voters may have simply been going for the lesser of several evils as opposed to something they truly liked. So cast your votes and let's see where we are Sunday night. In the meantime, don't submit any logos for these teams until the names are final. If you have a logo idea for one of the 5 other teams, here's how to submit! Are you satisfied with the team name Detroit Chargers? Are you satisfied with the team name Halifax Acadians? Are you satisfied with the team name Hamilton Steelcats? Are you satisfied with the team name Philadelphia Patriots? Can the Sharpshooters be called Saskatchewan Snipers instead? 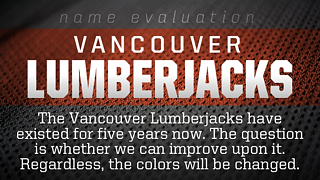 Are you satisfied with the team name Vancouver Lumberjacks? A simple majority will win these polls. For teams where the majority votes "yes," the new names will be locked in. For teams where the majority votes "no," things are a little more complicated. The names voted on will be discarded. I will quickly assemble a group of IceHL fans and participants (designers, GMs and all-around fanboys). This IceHL Branding Committee will hash out the details and do its best to come up with a satisfying team name. Their decision will be final. At that point, all 11 teams will be available to logo designers.